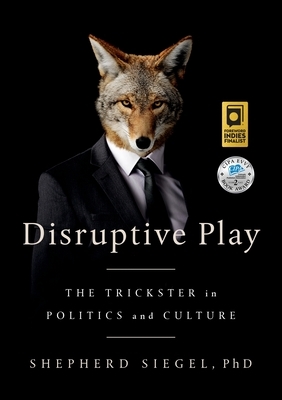 Shepherd Siegel discusses their new book, Disruptive Play: The Trickster in Politics and Culture. Disruptive Play: The Trickster in Politics and Culture journeys from ancient folkloric appearances of Tricksters such as Raven and Èṣù-Elegba, to their confined role in Western civilization, and then on to Trickster's 20th century jailbreak as led by dada and the hippies. Disruptive Play bears witness to how this spirit informs social progress today, whether by Anonymous, Banksy, Bugs Bunny, or unrevealed mischief-makers and culture jammers. Such play is revolutionary and lights the path to a transformed society. Original Play is the frolic and noncompetitive play that animals and human babies do in order to have fun and to keep on playing...not to win or to lose. It is a substance of the universe that occurs in all life. It is the behavior by which love and belonging are expressed, given, and received. When play moves into contest or other roles and rules, with winners and losers, it becomes Cultural Play. Issues of ego and narcissism are issues for Cultural Play, not for Original Play. Disruptive Play occurs in the rare times when the rhythms of Original Play suddenly appear in a political or cultural setting, settings conventionally fraught with Cultural Play. Like driving a clown car across the field during an official NFL game. Or Raven tricking Chief into releasing the sun, the moon, and the stars into the sky. Or a surreptitious Banksy graffiti that invades a museum or the public commons. Tricking power into performing an act of love. Disruptive Play: The Trickster In Politics and Culture connects knowledge from mythology, folklore, popular culture, art, politics, and play theory to make its casethatto be playful means not taking power seriously. At critical mass, power collapses and leaves us swimming about in the waters of the amoral Trickster.New values emerge and could lead to some version of the dystopia that currently drenches popular culture. Or, if people can discern between the authentic contact and exhilaration of play, and branded, mediated, alienated pleasure, then we just might stumble and frolic our way to the Play Society. Disurptive Play is ideal for enthusiasts of the human condition and those who hold out for the vision, however slim, of the Play Society. Disruptive Play: The Trickster in Politics and Culture journeys from ancient folkloric appearances of Tricksters such as Raven and Èṣù-Elegba, to their confined role in Western civilization, and then on to Trickster's 20th century jailbreak as led by dada and the hippies.